Varosliget is the first city park in the world. 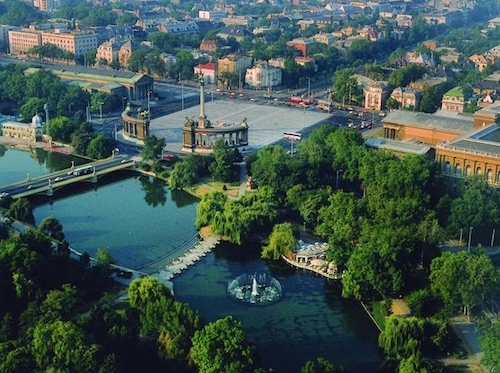 This is a significant city park, with Heroes Sqaure, botanical gardens, thermal baths, a swimming pool, Vajdahunyad Castle, Museum of Fine Arts, Transport Museum, Museum of Fine Art, and a zoo. There are several paths good for running. The park is is 300 acres, forming a 0.9-by-0.6-mile rectangle. A loop of the park provides a run of approximately 4k (2.48 miles). Several km of paths; 4km (2.4 miles) around the perimeter.